You know, sometimes it’s good to have some misconceptions, since you can then get delighted when everything turns out unexpectedly great. On our second day in London, after a morning trip to the Victoria and Albert museum, we were meeting up with another friend of ours, Guido, who was also in town. After some back and forth, we settled on rendezvousing across from Victoria Station for lunch. 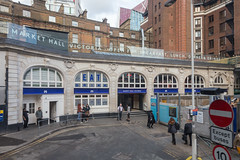 Throughout the entire decade we’ve been regular visitors to London, one of the most notable truisms is that Victoria Station has been in an almost unbroken string of construction projects, and heck, even on this visit various bits and pieces of construction fencing, plywood, and such still linger. But they did finish most of the project, and one of the major construction activities was the construction of Market Hall Victoria. This used to be part of a bus depot outside of Victoria, and then for years after that it was a kinda tacky nightclub fenced in by the sorts of touristy, red-bus-keychain selling souvenir booths outside many of London’s stations, but with this last renovation, it became Market Hall Victoria. To quote their marketing material, “Market Halls are redefining the British concept of food halls. Our goal is to give you the best food and drink in London, all under one roof.” Yeah, it sounds like a mall food court. I was dubious. That was my first misconception. Well, in some respects, it actually is a mall food court. With one little detail different: the folks that arranged Market Hall Victoria really did their homework and have a solid set of food vendors with some real chops. There’s Kerbisher and Malt serving up fish and chips. Koya Ko selling some really good looking Japanese udon and ramen bowls. Bunshop selling some funky bao-like British buns (Beef and barley, rarebit, etc), and Baozi Inn selling authentic bao. And, well, a lot of other places. But the one that drew me in was Gopal’s Corner. 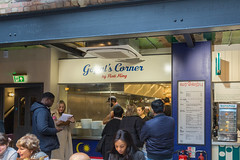 Gopal’s Corner is a sister restaurant to another up-and-coming food spot getting a lot of press: Roti King up by Euston Station. And since I really enjoy a good Indian roti, I figured I’d check it out. That was misconception number two. 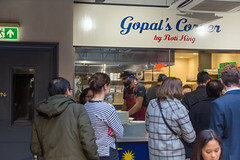 Gopal’s Corner (and Roti King) are Malaysian, and Malaysian cuisine is one of those great examples of multi-ethnic influence, since Malaysia is at the crossroads of Malay, Chinese, Indian, and Thai culture, and thus the cuisine blends concepts together from all of these. The highlights, however, are mostly Malysian Tamil, so that means a lot of Indian influence, including thosai (dosa), dals, chutneys, sambhar (a lentil stew), and, most importantly, roti. 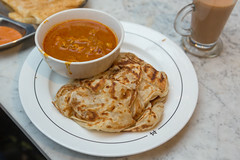 Instead of the Indian style roti (typically a hearty, whole wheat flatbread cooked to the point of having some crispy brown spots), the roti here is Malaysian-style roti canai, and part of the experience is watching it get made. It was too busy for me to get a good picture of the guy making roti, which is a shame, since it’s almost magical watching him. For each roti, to order, he takes a ball of oiled dough and rhythmically rubs it over the metal grill in front of him until it’s a thin, crepe-like pancake and starting to hold its form. Then it gets flipped a couple of times in a pizza-like manner until it’s much larger than a typical dinner plate. He then folds it up into a square-like package and lets it grill until crispy, flip, and repeat. As the last step, he kind of fluffs it up and deflates it with his hands, serving it up alongside a bowl of curry. The resulting dish is surprisingly awesome despite the simplicity. The star here is the roti itself: it’s the perfect bit of crispiness, having a wonderful airy and croissant-like texture, eating it by pulling off little chunks and dipping it into a dal or kari served alongside, in my case, opting for chicken. The chicken kari itself was no slouch, however; while mostly being chicken and onion in a curry sauce, the sauce had a surprisingly bold flavor and smooth, velvety texture. I’d happily get this just as a curry. The result of this combination was a near-perfect example of a good “street food”. I had a lot of great food on this trip, but this is one of the items that left me with a serious craving. 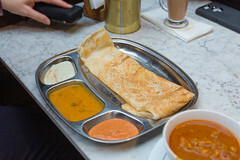 Carol opted for the thosai (dosa), served with two chutneys and sambhar, a lentil-based stew. This was also a perfectly done thosai, with a perfect crisp to it, and another data point in technique (I’ve been trying out making dosa at home, and discovering that there’s definitely some art and skill to it). Both the chutneys and the stew were delicious as well, and this is a rather enjoyable dish, although not quite in the same class as the roti. 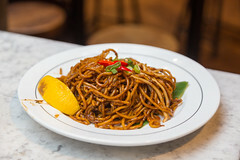 Our friend Guido opted for another popular item: mamak mee goreng: stir fried egg noodles coated in a chile-based peanut sauce, tossed with tofu, chicken and shrimp. The result is a really delicious and spicy combination of noodles, heat, and protein, and being served up piping hot on a banana leaf actually infuses some of the banana leaf flavor into the dish. The result was pure deliciousness, and I can see why it is almost as popular as the roti. Overall, I had two misconceptions: I was expecting Indian food in a food court (which isn’t necessarily bad, I’ve had some pretty good Indian food in some otherwise dismal food courts and strip malls), and instead, I had some top notch, crave-worthy Malaysian roti canai and kari, and have dedicated myself to trying my hand at making roti canai myself. I guess it all works out in the end.